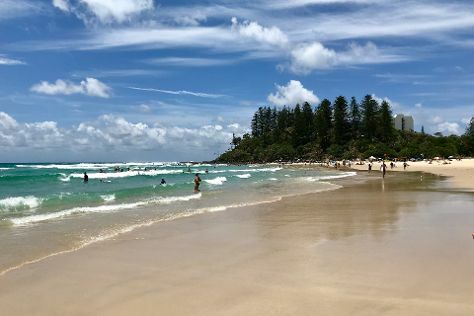 On the 19th (Sun), kick back and relax at Coolangatta Beach, enjoy the sand and surf at Burleigh Heads Beach, and then explore the striking landscape of Burleigh Head National Park. Here are some ideas for day two: explore the wealth of natural beauty at Natural Bridge. For photos, other places to visit, ratings, and tourist information, read our Gold Coast online trip builder . Zurich, Switzerland to Gold Coast is an approximately 27-hour combination of flight and train. You can also fly; or do a combination of train and flight. You'll lose 9 hours traveling from Zurich to Gold Coast due to the time zone difference. Traveling from Zurich in May, things will get somewhat warmer in Gold Coast: highs are around 27°C and lows about 15°C. Wrap up your sightseeing on the 20th (Mon) to allow time to drive to Mooloolaba. Kick off your visit on the 21st (Tue): enjoy the sand and surf at Mooloolaba Beach, then discover the deep blue sea with a scuba or snorkeling tour, and then get great views at HMAS Brisbane Lookout. Keep things going the next day: hike along Mary Cairncross Scenic Reserve, kick back and relax at Kings Beach, and then enjoy the sea views from Caloundra Lighthouses. You can plan Mooloolaba trip in no time by asking Inspirock to help create your itinerary. Getting from Gold Coast to Mooloolaba by car takes about 2 hours. Other options: take a bus; or do a combination of train and bus. In May in Mooloolaba, expect temperatures between 27°C during the day and 15°C at night. Wrap up your sightseeing on the 22nd (Wed) early enough to travel to Airlie Beach. Kick off your visit on the 23rd (Thu): stroll through Whitehaven Beach, add some adventure to your tour with a kayaking and canoeing tour, and then look for gifts at Grotty Yachty Clothing. Get ready for a full day of sightseeing on the 24th (Fri): take a tour by water with Boat Tours & Water Sports. For maps, other places to visit, where to stay, and more tourist information, use the Airlie Beach online trip itinerary planner . You can do a combination of flight and bus from Mooloolaba to Airlie Beach in 5.5 hours. Other options are to drive; or do a combination of train and bus. Traveling from Mooloolaba in May, you can expect nighttime temperatures to be somewhat warmer in Airlie Beach, with lows of 24°C. Cap off your sightseeing on the 24th (Fri) early enough to travel to Magnetic Island. On the 25th (Sat), step off the mainland to explore Magnetic Island Forts Walk, cast your line with a fishing tour, and then take an in-depth tour of Magnetic Island Museum. To see traveler tips, ratings, reviews, and more tourist information, read Magnetic Island online road trip planner . Do a combination of car and ferry from Airlie Beach to Magnetic Island in 4.5 hours. Alternatively, you can do a combination of bus and ferry; or do a combination of bus, train, and ferry. When traveling from Airlie Beach in May, plan for a bit warmer days in Magnetic Island, with highs around 32°C, while nights are about the same with lows around 21°C. Cap off your sightseeing on the 25th (Sat) early enough to travel to Port Douglas. Kick off your visit on the 26th (Sun): discover the deep blue sea with a scuba or snorkeling tour. Get ready for a full day of sightseeing on the next day: get interesting insight from Tours. To see maps, reviews, traveler tips, and more tourist information, read Port Douglas online day trip planner . Traveling by combination of ferry, flight, and shuttle from Magnetic Island to Port Douglas takes 5.5 hours. Alternatively, you can do a combination of ferry and car; or do a combination of ferry, bus, and shuttle. In May in Port Douglas, expect temperatures between 32°C during the day and 24°C at night. Finish up your sightseeing early on the 27th (Mon) so you can go by car to Cairns. Escape the urban bustle at Trinity Beach and Scuba & Snorkeling. Explore hidden gems such as Historic Village Herberton and Australian Butterfly Sanctuary. You'll find plenty of places to visit near Cairns: Artistree Gallery (in Yungaburra) and Barron Falls (in Kuranda). The adventure continues: identify plant and animal life at Atherton Tablelands and take some stellar pictures from Glacier Rock Lookout. To find more things to do, other places to visit, reviews, and tourist information, refer to the Cairns trip planner . Getting from Port Douglas to Cairns by car takes about 1.5 hours. Other options: take a bus; or take a shuttle. Expect a daytime high around 32°C in May, and nighttime lows around 24°C. Finish your sightseeing early on the 30th (Thu) so you can travel back home.